As conferences go, MWC felt relatively subdued this year, at least from an Android perspective. Huawei decided to sit this year out and launch a Windows tablet, Sony had a quiet event and HTC just sent out a press release for its new Desire series. While press events weren’t jam-packed in to a crazy schedule, there was still some exciting and fun stuff happening in Barcelona this week. In past events it has seemed a lot like companies chose quantity over quality. There were numerous phones being announced, with several launch pressers clashing. 2016 was different. There were fewer events for new smartphones, which meant a smaller number of new devices to check out. But the quality this year was pretty high from most manufacturers. LG announced an interesting new modular concept for its line-leading smartphone series, while Samsung showed off its latest flagship phones. Alcatel surprised us all with its metal-and-glass premium phones, while HTC’s Desire series got a splash of color. Check out our highlights from MWC this year below. There were many things to love about LG’s announcements at MWC 2016, and a lot was riding on them. Whether or not the Korean manufacturer has a successful year is yet to be seen, but I loved its entire presence and the manner with which it presented its next smartphone (and friends). LG’s entire message was entirely based around making the smartphone fun and appealing again. It didn’t seem to be taking itself too seriously. The press event was loud and colorful. It wasn’t pretentious, and they didn’t wax poetic about some nauseating desire to capture the millennial market, or harness the influence of nature in product design. It was “Hey, look at this cool thing, look at the cool stuff it does”. It was simple and effective. It’s the first press event I’ve been to and genuinely enjoyed, rather than sitting cringing my way through an endless string of buzzwords and marketing talk. Of course, the G5 was the star of the show. Its modular design is arguably gimmicky, and I’m undecided on its potential. With that said, I do like that the battery is removable, and I like the CAM Plus module a lot. It’s now up to LG to create enticing and interactive modules to work with the G5 that extend beyond just the camera control and a B&O branded DAC unit. The phone’s design looks and feels fantastic. It’s a massive departure from the thin, plastic smartphones of previous years and is an upgrade I feel the G-series desperately needed. What’s more, this year, it’s powered by the creme-de-la-creme of processors (SD820), has a great display, and the new user interface looks great and is fast and fluid. It probably won’t sell as well as Samsung’s new phones, but it’s at least competitive. Then there are those really cool ‘Friends’ LG announced alongside the phone. The 360-degree camera and USB connected headset are a tentative attempt to enter the VR market. The BB-8-esque Rolling Bot was very cool, and looks like it’ll be great fun for families. What’s more, the simple drone remote dubbed Smart Controller which looked like something from a Star Trek movie is a great concept. The idea is to have a physical remote that makes drone piloting so easy that anyone can do it. While Samsung wowed us with its flashy VR-based announcement, it’s LG announcement and family of devices I’ll remember with most fondness from this year’s Mobile World Congress. Samsung has a lot more capital than any other Android OEM and so, naturally, their press events spare no expense. This year, they had Gear VR headsets set up on all the seats, each with a Note 5 inside them. The stage originally started as an enormous closed square box with projection screens on the outside, right up until all four walls lifted up in to the air to reveal the company’s smartphone design chief. Later on, they surprised us all with the appearance of Mark Zuckerberg. The Galaxy S7 and S7 Edge are everything the S6 and S6 Edge should have been, but that’s often the case with any follow-up product. The S7 Edge in particular impressed me. It has the curved glass edges on the front and back to make it feel way thinner than it is. What’s more, Sammy’s newest Edge-optimized software finally feels like it’s out of beta. The Edge panels are large and beautiful, as well as being versatile and open to third-party developers. Like LG, Sammy launched a new 360-degree camera alongside its latest smartphones. For gamers, there was an announcement that the S7 includes the Vulkan API which Samsung claims will enable console-quality gaming. EPIC got on stage to show just how smooth games were rendered on the new devices. As you’d expect, it looked fantastic, and will undoubtedly lead to even better VR experiences using Samsung’s Gear VR headset. HTC didn’t announce any new flagships this year at MWC. Instead, like two years ago, we got a new Desire series of smartphones. The 530, 630 and 825 are all designed to look like they belong to the same family with their Jelly Bean inspired paintwork and plastic build with rounded corners and edges. Spec-wise, there’s nothing really notable about the new phones, except to say that the 530 is a great looking device at its entry-level price point. Although not as competitive as the likes of OnePlus or Honor, the HTC Desire series normally offers a decent experience for those on a budget. At least, when compared to the likes of LG, Samsung and Sony’s offerings. I have no doubt that these new speckled models will be the same, especially with the more efficient Android Marshmallow OS onboard. A few years ago, Alcatel was a brand known for releasing cheap, plastic smartphones that offered very little except a low price. Last year, that changed with the Idol 3. Now they had a powerful smartphone with great specs and a great price. What’s more, using the device on a day-to-day basis was pleasant. It saw the company take a step towards the high-end market. This year, it took an even bigger step. The plastic is gone, and in its place is a device made from glass and metal. The screen on the 4S looks stunning, and the metal frame is elegant and classy. What I like about the 4 and 4S is that they use the good parts of the Idol 3 — clean UI, seamless design and great battery — and improve upon other parts like the hardware specs, build quality and performance. Sony announced this week that it is discontinuing the Xperia Z brand in favor of its slightly underwhelming Xperia X lineup. With that said, I really love the design of the Xperia XA. 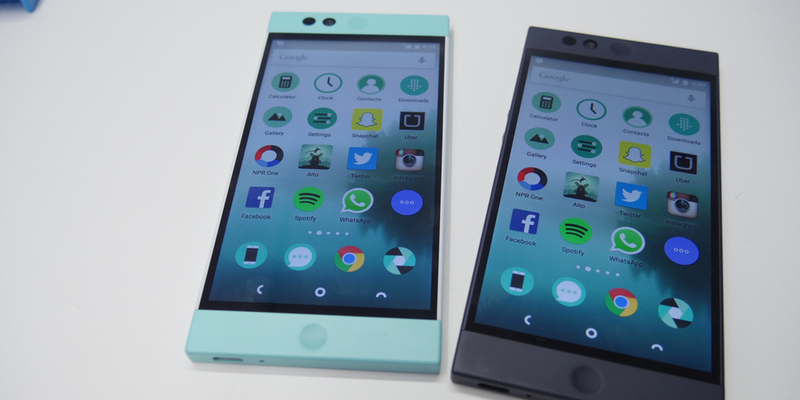 The phone has a virtually edge-to-edge screen on the front with curved edges. It’s a very eye-catching design and the screen is colorful and full of contrast, even if it’s not the sharpest. It’ll more than likely be overpriced, but it still looks great. Nextbit didn’t have an announcement or official press event at MWC, but it did have a meeting booth where I got to see the Robin for the first time. As I wrote yesterday, it was love at first sight, and for me, it’s the most memorable device I checked out while I was in Barcelona this week. It’s not high-end, but it’s smooth, has a unique look and a very clean interface. It ticks all the right boxes for me.